The raffle has taken place and a Mr & Mrs Bennicke ticket number 661 have won. 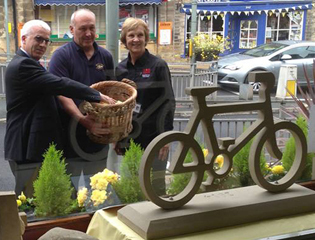 The raffle was drawn by Dr Wyatt who is one of the doctors on the Yorkshire air ambulance. We have raised £1350 and Mr & Mrs Bennicke have kindly donated another £150 to bring the total to £1500.00. Mr. Bennicke was a tour maker for the race and is really pleased to be the winner, he lives in Warrington. 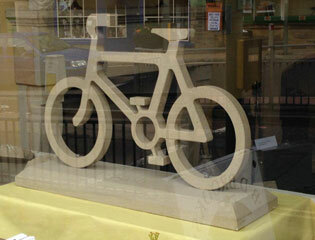 To celebrate the arrival of this year's Tour De France in Yorkshire, this stone bicycle will be raffled to raise money for Yorkshire Air Ambulance, tickets are available directly from the showroom or telephone 01422 822220 for more details.